The Atari 2600 console was one of my earliest video game experiences as a child growing up in the 80’s, having several friends who owned one, but I never had one myself until around 10 years ago, when I started collecting retro video games. As an early arcade manufacturer, Atari were able to produce some classic home conversions of their popular coin-ops, allowing gamers to experience the “arcade at home” that we all longed for at the time. That’s not to say that the Atari 2600 didn’t have it’s share of exclusive titles, with some fantastic original games being produced for the console. 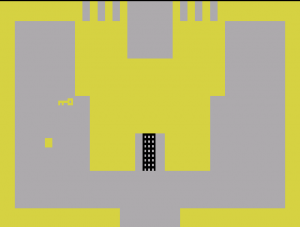 The graphics on the Atari 2600 were fairly basic, and the gameplay restricted by the design of the processor, but it supported a surprising array of titles, and skilled programmers were able to work around its limitations to produce some amazing games. So much so that a list of the 10 best games barely scratches the surface of the little wooden Atari’s excellent back catalogue. 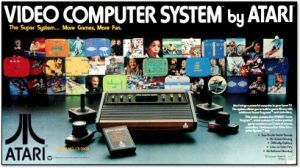 The Atari 2600’s popularity was also its downfall, suffering from an avalanche of “shovelware”, with a huge volume of poor quality software released as companies jumped on the video game bandwagon. Ultimately this contributed in a crash that took the games industry several years to recover from. But we are not looking at shovelware here, far from it, as I look at some of the greatest games ever created for the Atari 2600 console. 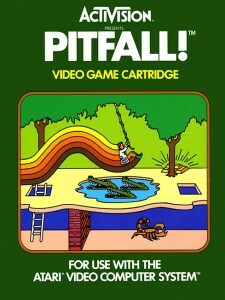 My introduction to Pitfall was via the arcade version which I stumbled across whilst on a family holiday. Remember this was a time when video games consisted of mainly of Pong, and the idea of controlling a character who could run, jump and swing across the screen was something truly magical. The term “platformer” had not been invented at this stage, when all arcade games were referred to as Space Invaders. The inevitable home conversion on the Atari 2600 was a revelation, managing to capture the spirit of the original game in all it’s “flick screen” platform glory. The pits, rope swings, scorpions, alligator filled lakes and rolling logs were all there, as you embarked on an Indiana Jones style mission to get to the 32 treasures spread throughout thegame, and get back in one piece before the time runs out. Pitfall was seminal, in that it marked a move away from the “quick fix” of arcade inspired titles before it, having a 20 minute duration and more open world feel. The story of the original Atari 2600 PacMan is the stuff of gaming legend – a truly horrific conversion that is held up as the beginning of the end of the first era of videogames, heralding the great crash of the early 80’s. The original game was made in huge volumes, on the expectation that everyone (pretty much anyone who owned a 2600) would want a copy, but it was so poor that many of them ended up in a New Mexico landfill which was rediscovered in 2014. The sequel Ms PacMan was effectively a PacMan 2, and second chance for Atari to perfect the format on the 2600, and the result was indeed perfect. All of the horrible screen flicker of the original was banished, replaced with a detailed (if condensed) maze, characters that actually looked like the original arcade version, and some decent sound effects. Most importantly it was fun to play, unlike the original 2600 version, and deserves a place in the Atari 2600 Top 10 games of all time. The vertically scrolling shooter has been a hugely popular video gaming genre, but the Atari 2600 had relatively few of these games due to the difficulty in creating the scrolling effect on the limited graphics hardware. River Raid however managed to work around these limitation to create a hugely playable shooter that is a firm favourite with Atari 2600 fans. The game featured some novel risk / reward elements, such as the need to refuel your ship on a regular basis by flying over fuel depots, which often required you to fly perilously close to the canyon walls. There were also multiple enemies to be avoided or destroyed, from fighter jets to helicopters and warships, and bridges that needed to be taken out before you crashed into them. River Raid was famously banned in Germany due to the level of aggression and destruction on display, only being permitted many years later to allow its inclusion in a PS2 anthology. They missed out on a great Atari 2600 game! The original “must have game”, Space Invaders was the title that lead many people to purchase an Atari 2600 in the first place, such was the interest in owning a home version of the classic arcade game from Taito. All of the features from the arcade were there, including the descending alien ships, bonus mothership, defensive shields and sound effects that increased in tempo as the on screen action became more frantic. 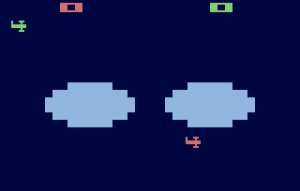 The number and shape of the aliens may have been different, but Atari compensated for any cosmetic variations by introducing multiple variations in the game, with features such as 2 player, moving shields, invisible aliens and zig-zagging missiles. In fact there were so many variations of the Space Invader format that up to 112 unique game types could be played. The standard game however is still the best, and the reason that the game sold in the millions. Space Invaders is a game that no Atari 2600 collection should be without. 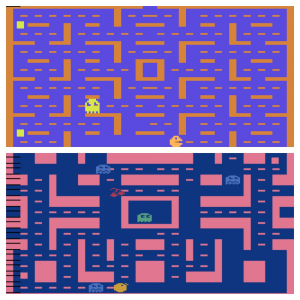 Much like PacMan before it, the original Defender game on the Atari 2600 had a number of key differences with the arcade original that made it less than perfect, for example…. The second game, which was titled Defender 2 on early versions but renamed Stargate later to mirror the Arcade sequels to Williams classic horizontal shooter. All of the key features were there in the game, which focused on a lone pilot defending the surface of a planet that was several screens wide, and preventing aliens from picking up the inhabitants and converting them into hideous mutants. Your only guide to the location of the aliens was the radar at the top of the screen, allowing you to locate the aliens before they kidnapped the humans, or rescue any humans that had already been accosted. Somehow, despite the variation in graphical detail of the 2600 compared to the arcade version, which also included a complex control system that used a joystick and 3 different buttons, Atari pulled off the impossible and created a perfect port of Defender. Much has been written about this seminal game, a smash hit for Atari and one of the most fondly remembered from early 80’s arcades. There was huge gamer demand for a home conversion for the 2600, and it was a very passable effort. It was always going to be difficult to replicate the original, given that it used a trackball and 3 different fire buttons compared to the joystick and one button of the 2600, but the programmers managed to replicate the feel of the game if not the actual look and control scheme. But putting aside the differences, it is a great game in its own right and very playable, and another solid entry into the Atari 2600 Top 10 games. Adventure was for many their first taste of an “open world” game, albeit one contained in a cartridge that wouldn’t be big enough hold the code for your toaster today. The objective of Adventure was to locate a chalice and return it to it’s home in the Yellow castle, and along the way battle dragons, avoid troublesome bats and solve problems using items found along the way. Swords kill dragons, keys unlock doors, magnets drag items from inaccessible areas, everything has a purpose which is automatically revealed when you carry the item into the right location. Although space was tight on the Adventure cartridge the developer found space to create one of the world’s first video game “Easter Egg’s”, where an invisible object could be carried to a particular room resulting in a display of the author’s name. Adventure was a great game, unique at the time and playable even today. As one of my earliest video game memories, Combat will always represent what is best about 2 player video gaming – where the competition is fierce but fun, and what starts out as a quick game becomes “best of 3” then “first person to 10” and ends up in an all night gaming marathon. Taking a very simple premise a dogfight, 2 players start in different parts of an arena and have to position themselves so that they can shoot the other player before they shoot you. The arenas in question vary from aerial battles in the sky between 2 pilots, to land based battles between rival tanks, but always with the same objective. The aerial battles differ in that your planes have to keep moving and require deft control to get into an attacking position, whereas tanks can remain stationary and rely on walls for cover – more a game of cat and mouse. There were 27 different variations in the game, including jets as well as bi-plane battles, different types of terrain and cloud cover and different missile types including guided missiles controlled by the joystick once fired. Better than Pong, Combat took the two player gaming experience to a new level and delivered an Atari 2600 classic. Much has been written about the original asteroids, a game that used unique vector graphics and an oppressive soundtrack that ramped up as the titular Asteroids filled the screen. Asteroids was an important game for Atari 2600, another reason to own a 2600 console and play the game you loved in the arcade. 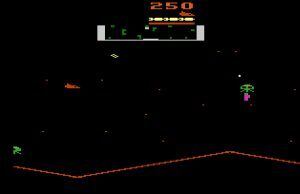 Given the basic nature of the graphics the game had no right to exist (see my full review of Asteroids for the Atari 2600) but Atari managed to pull off the impossible task of making it playable – if not graphically identical. 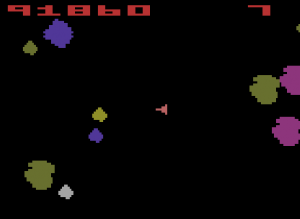 Although the Asteroids were solid, and the ship could only fly in one of 8 directions, the game was great fun and managed to capture the spirit of the original. Kaboom is one of those Atari 2600 games that you just had to be there to appreciate – the premise being one that would fail to shift a free to play iPhone game today, it’s that basic. Your job is to foil the evil plot of the “Mad Bomber”, identified by his stripy jumper, catching the bombs he drops from the top of the screen in your bucket. And that’s about it. 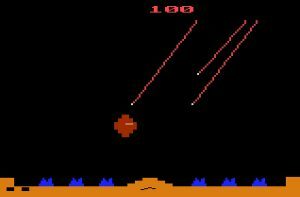 The secret of Kaboom on the Atari 2600 is the addictive nature of the gameplay, as you whizz around the screen in your paddle controlled bucket collecting explosives thrown by the increasingly erratic bomber. The game doesn’t end until you reach the high score of 999,999 – by which you will have been steering your bucket for nearly 3 hours, and with no reward apart from the knowledge that you have mastered one of the Atari’s 2600 best games. 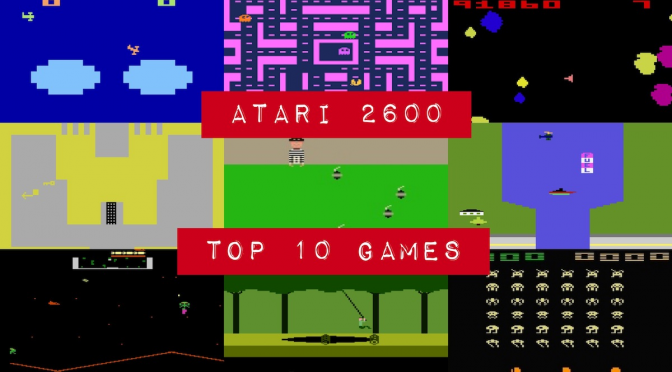 There are a few games the deserve an honourable mention, including arcade greats Frogger, Pole Position, Pong, Joust, Galaxian, QBert and Centipede, all of which were every popular on the Atari 2600. I also had soft spot for Phoenix in the arcade which was replicated on the humble 2600, as well as Phoenix clone Demon Attack. Although ET was rubbish, there were some other successful film tie-ins, my favourite being The Empire Strikes Back where you get to take on an Imperial AT-AT Walker in a snowspeeder, just don’t try any of the other Star Wars games on the Atari 2600 as they were mostly terrible. If you are after an original space shooter for the Atari 2600, you could do worse that try out the excellent Yars Revenge, which should maybe have been in my top 10 as Atari’s second highest selling game after Pac Man, and it’s highest selling original game. Rather than multiple enemies, you need to battle a single enemy through a force field by breaking through its defences and avoiding its homing attack. And no review of the top Atari 2600 games would be complete without a mention of Haunted House, an early example of “survival horror” which was as memorable for the disturbing box art as the game itself. I should probably be pointing out all of the different Atari 2600 emulators available, so that you can try out some of these great games, but that would miss the point of this console. You need to experience tuning a TV to the right channel, blowing the dust out of the cartridge slot, untangling the wires and then hitting the power switch. You need to see the brightly coloured screen fizzle into life, select the right game mode and then bash the single big orange button on your joystick to start the game. Check out my own Atari 2600 renovation project if you want further inspriation. So get yourself onto ebay, and pick up a console with a bunch of mixed cartridges for less than the price of a new XBOX or PS4 game. Just like I did. You won’t regret it.